Redefine Blogging With BlogAdda’s #WINxpress At Ahmedabad! As the virtual world is at par, we make sure that we are heard through it in the best possible way. One of the medium to pen down your thoughts and inspire readers is blogging. It’s every blogger’s dream to stand out from the crowd and be recognized for their blog. And we at BlogAdda are excited to start the coming year with the spirit of blogging and inspire budding writers. For that purpose we are organizing our first #WINxpress event at Ahmedabad. How enthralling it will be to meet different bloggers and also the team of BlogAdda! Come and join us for our event and let blogging do the talking. After all, there is no inspiration without motivation and sharing your views makes a huge difference. So, come join in with the team of BlogAdda and let blogging be a game changer in your life! After the successful completion of WIN 2014 and 2015, an event that was organized to celebrate blogging. 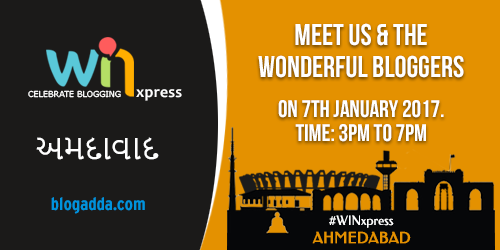 We now bring the experience to your city with WINxpress where the bloggers from Ahmedabad will share their success stories and views on blogging with us! Write: Sessions and workshops will be held to help you grow and learn more about the world of blogging! Inspire: Get inspired by listening to wonderful speakers share their experience of blogging. Question and answer round with the bloggers. The question that pops up in the mind of every blogger as to what’s next? What’s new to make their blogs shine more! Network: Meet some of the elite and polished bloggers from Ahmedabad and get a chance to witness their success stories and generate cauldron networking. Along with the above sessions there will also be fun and interactive activities for all you bloggers. Witness this beguiling event over hi-tea! Registration fees is 500 INR. Where: Cafe City Monk, Shop Number 1 Basement New York Trade Centre, SG Highway, Sarkhej Gandhinagar Highway, Ahmedabad – 380055, Near Ford Showroom. I am waiting for this since long. Thanks for organizing it. But as I would love to attend and learn more , but can’t even afford Rs 500 to attend. Kunal, we will ensure it is worthwhile for you. Would love to meet you. Do come. Who will be speaker there? is there any Discount Coupons available for this event? Please email me i want to register. Would love to attend, but busy on that day. Already works are there. When will you organize such a great event again sir. Request you to arrange such sessions soon.